Spine, corners and back cover bumped. Nothing ever happens in August, and tenacious sleuth Kate Shackleton deserves a break. Heading off for a long-overdue holiday to Whitby, she visits her school friend Alma who works as a fortune teller there. Kate had been looking forward to a relaxing seaside sojourn, but upon arrival discovers that Alma's daughter Felicity has disappeared, leaving her mother a note and the pawn ticket for their only asset: a watch-guard. What makes this more intriguing is the jeweller who advanced Felicity the thirty shillings is Jack Phillips, Alma's current gentleman friend. Kate can't help but become involved, and goes to the jeweller's shop to get some answers. When she makes a horrifying discovery in the back room, it soon becomes clear that her services are needed. 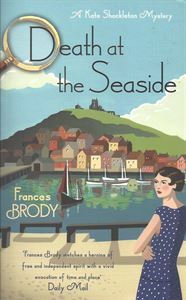 Met by a wall of silence by town officials, keen to maintain Whitby's idyllic façade, it's up to Kate - ably assisted by Jim Sykes and Mrs Sugden - to discover the truth behind Felicity's disappearance.